Does Sasquatch have the ability to cloak? Why does Sasquatch seem to disappear so quickly when spotted by humans? 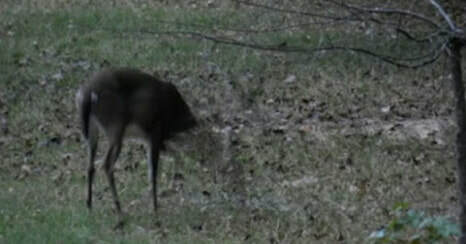 If you didn’t say “cloaking,” you may want to take a series of photos taken by a game camera that a Sasquatch expert claims show a deer’s head disappearing because one or more cloaked Sasquatch's stepped in front of it. Far-fetched? A number of people would disagree. The photos were taken near Dadeville, Alabama, and posted on Facebook by Frankie Knox Wilemon, where they were seen and analyzed by Sasquatch blogger Samantha ‘Sam’ Ritchie of Planet Sasquatch. Samantha believes the portions of the photographs where the deer’s head is missing give indications that it was actually blocked by a Sasquatch or some other being while it was in cloaking mode. After further magnification and enhancement, Sam points out two heads that could be Sasquatch or some other creatures. These are not the first claims of Sasquatch having the ability to cloak itself or the first evidence of it allegedly happening. This video taken in January 2013 uses thermal imagery to show what appears to be a cloaked or opaque figure running that could be a Sasquatch. According to Scott Carpenter, author of “The Sasquatch Field Journal,” Sasquatch goes into a cloaking or predator mode (named after the movie “Predator”) by using infrasound to convert water vapor in the air around it into microscopic prisms that reflect (maybe a better term is “deflect”) light away from their bodies. He claims this leaves a telltale distorted image that doesn’t quite match the background (leading skeptics to suspect editing) and says he has taken video footage of a Sasquatch in this cloaked or predator mode.